No vaccine or treatment currently exists for the viral disease, which causes flu-like symptoms and severe joint pain that can be debilitating and long-lasting. The disease is common to tropical regions but has made its way north in recent years and spread to the southern United States. With funding from the National Institutes of Allergy and Infectious Diseases (NIAID), the Frederick National Lab produced the test vaccine and identified six Caribbean sites for the clinical trials. The goal of the trials is to continue evaluating the vaccine’s safety as well as its ability to stimulate an immune response, including the creation of antibodies needed for protection against the virus. Study follow-up visits for enrolled participants will continue through March 2018. 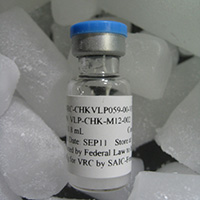 The national lab’s Vaccine Research Center, operated for NIAID, manufactured test vaccine for both the Phase I and II trials using virus-like particles grown in a cell culture. The virus-like particles contain no disease-causing genetic material, but preserve features of the virus that can stimulate a protective immune response. After cell culture and VLP expression in a bioreactor, the cells were clarified via depth filtration and then purified via column chromatography and ultrafiltration and diafiltration steps. The formulated vaccine was sterile filtered and then frozen. Samples were submitted to quality control to ensure the vaccine met the desired production specifications. Next, the fill/finish group thawed the bulk vaccine, filled it into vials, and froze it until it was needed for clinical trial use. The national lab’s Clinical Monitoring Research Program (CMRP) identified six study sites: two in the French territories of Martinique and Guadeloupe, two in Puerto Rico, one in Haiti, and one in the Dominican Republic. By October 2016, a total of 400 subjects were enrolled in the study. CMRP will continue to support the study by managing and overseeing the clinical sites and ensuring their compliance with all U.S. federally mandated regulatory requirements and government policies, as well as working with study sites to ensure applicable in-country regulations are followed. Subject recruitment, retention, and follow-up will also be handled, as well as a complete data analysis of study results.